In a Nutshell: As a financial service provider, the way you handle your customers’ data is paramount. Billions of consumers have had their personal data compromised in massive data breaches, including those at Equifax and Yahoo!, which have brought the issue of privacy to the forefront yet again. Cyren is a cloud-based firm that offers email filtering and web security solutions to companies across the globe. Its continuously updated infrastructure handles nearly 2% of the world’s email traffic and protects billions of users from more than 300 million potential phishing and malware attacks daily. Its services — which cost up to 80% less than hardware-based security solutions — protect not only your customers’ data, but your business’s reputation. I woke up one morning in 2014 to a surprise. On a whim, I checked my credit card account from my phone and found a $350 charge from the night before at a Cheesecake Factory in San Francisco. Now, I love strawberry cheesecake as much as the next guy, but my dessert budget only goes so far. And I certainly didn’t get back to my bed in Florida that quickly. As it turned out, my credit card number was part of a data hack that included the payment information of 56 million other Home Depot customers. My card was shut down for several days, and bills automatically charged to it each month had to be rerouted before they were rejected. I spent hours filling out paperwork and on phone calls with customer service, and I didn’t even get a slice of cheesecake as an apology. There’s no telling exactly how much business Home Depot lost as a result of the hack. For financial services companies, which tend to gather more personal data than do retailers, nothing is more vital than the security measures protecting the information they collect and store. You can offer the best interest rates or loan terms in the world, but if customers don’t feel safe with you, they won’t stick around. Some of the biggest names in American business, including Google, Microsoft, and Dell, trust Cyren with their data protection needs. 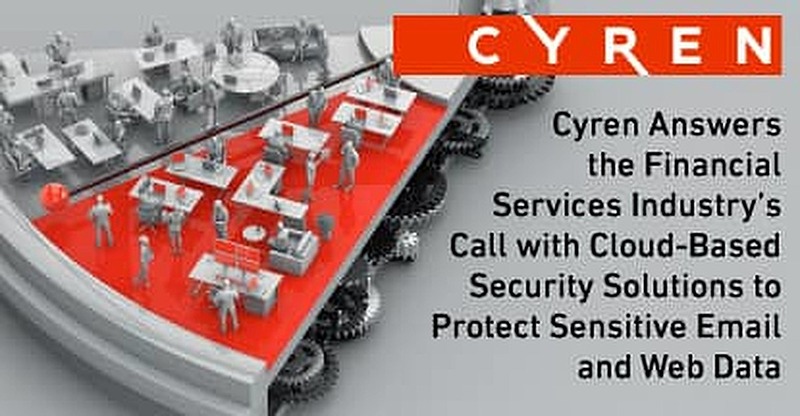 Whether it’s filtering emails to avoid risky spam or phishing scams, or protecting your network from employees who may do some questionable surfing on their downtime, Cyren’s systems handle more than 25 billion security transactions every day in every corner of the globe. The significance of cloud-based security — as opposed to more conventional approaches — matters to your bottom line. Traditional security solutions include hardware that has to be installed, hosted, and regularly upgraded in your space and at your expense. With Cyren’s systems running exclusively in the cloud, they can be upgraded, scaled, and shared with no extra work on your end. The overall cost of Cyren systems can be as much as 80% cheaper than those of hardware-based security firms. Plus, signing up is quick, and new customers receive a 30-day free trial. You can begin using the software and benefiting from one of the web’s top security companies instantly. The lifeblood of any financial service provider is transactions. Long before a customer comes to you for a loan or to set up a new account, they’ve spent time protecting their personal data and working to improve their credit histories or financial profiles. Their trust in you is what keeps them coming back. It’s what keeps the bills paid. Mistakes happen. A random email sent to an employee looks like it’s from a friend. Click on this link to see a funny meme. The employee clicks, and just like that, your entire network has been infected with a virus that hijacks customer data in an instant. It’s called phishing, and the underhanded practice is growing at an alarming rate. Protection against such attacks is part of the two main products offered from Cyren. It’s a risk no company can afford to take. It’s the reason why organizations, like Intel and T-Mobile, trust Cyren for their email security. In October of 2017, the company introduced an Email Archiving service that allows messages to be stored for easy retrieval on the cloud, making compliance, legal, and transactional issues easy to take care of for organizations of any size. Cyren’s Web Security Gateway provides a multi-layered defense against malware, ransomware, or phishing attacks from any location or device. It inspects inbound and outbound traffic and keeps threats on the perimeter before they can gain access to sensitive information. Since it’s connected directly to the cloud, it can be updated in real time when new threats emerge, and all of your users can be protected whether they are in the office or out in the field. This secures and isolates all of your important transactions on a system that keeps attackers at arm’s length. Cyren takes pride in its legacy as one of the first, and largest, cloud-based security solutions firms in the world. And when Cyren says the world, it means the world. Employing a diverse network of engineers and developers means the company is sensitive to issues in different parts of the world. After all, a financial provider in London has different needs than one in Tulsa, Oklahoma. It also means that customer service is well-versed on the varying customer demands. To meet the high expectations of its financial service clients, Cyren offers multiple forms of support outreach, from a dedicated phone line, email ticketing, and an online chat. New types of cyber attacks take place each day, and Cyren’s infrastructure is prepared to handle the ever-changing landscape of internet security. It’s something Dan says keeps the company from never truly resting. The sensitive data your customers trust you with is always at risk without the proper security measures. Your business is your life. No two days are alike, and the thieves who target your customers’ financial data aren’t taking any days off. One attack can cost untold amounts of money and man-hours or, even worse, your hard-earned reputation. Cyren’s email and web security gateway features superior cloud-based technology that constantly updates to keep your business safe. This saves you time, money, and stress in the long run, allowing you to enjoy your own cheesecake instead of paying for someone else’s.